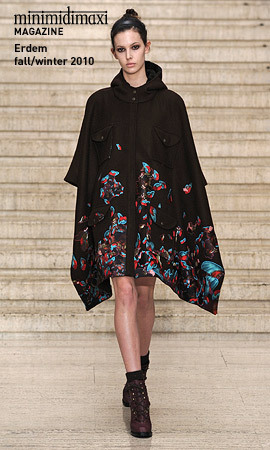 Erdem Moraliogluâ€™s fall-winter 2010 collection evokes forest walks on temperamental October days, surrounded by rainswept colours and with kaleidoscope in hand. With a patchwork of dramatic skies that turn from brilliant blue to cloudy grey, through flocks of swallows and canopies of trees, this Montreal-born designer delivers an earthy and sensuous offering, seen through a looking glass. On an autumnal palette of gold, brown, rust, dark aqua and pale grey, blurry prints of arctic birds and leaves dramatize his softly structured bell-shaped skirts and shifts with embroidered foliage of the same hues. This girlish spirit could have been garish with a super-saturated colour palette, but the collection maintains restraint with a melancholic dose of soft grey, most notably in a rosette bolero jacket and a lace dress with aqua and copper embroidery. Short layered ruffles on bodices also have this touch of sobriety, despite a sprinkling of beading. While Erdem had cozy sweater coats with smatterings of embroidery and rich leather trenches to survive the outdoors, it was the long lean dresses reminiscent of neoclassical sculpture that have me reconsidering my outdoor wardrobe. In lace, satin and print, the moving hems billow with each step, as if setting the printed wild birds in flight.